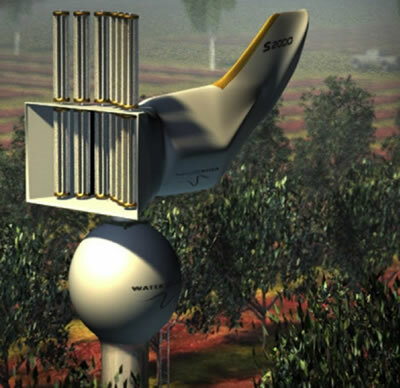 Max Water pulls water out of the air by using wind power; it is the invention of Dr. Max Whisson of Australia. Necessity is the mother of this invention - Australia is in the grip of the worst drought in a century. When I first reported on Max Water, the technology was a mystery (see Whisson Windmills To Water Australia Like Vaporators?). Additional information has surfaced; take a look. Water is present in the air all over the earth; this dissolved water is called "humidity." At 30 degrees centigrade, with a relative humidity of 60 percent, each cubic meter of air contains about 18 grams of water. If you can cool the air to 5 degrees, the air can only retain about 8 grams/cubic meter of water; the remaining 10 grams per cubic meter will condense as fog or droplets. Dr. Whisson's Max Water device accepts moving air, letting it flow over turbines that produce electricity. This in turn powers a cooling condenser that lowers the temperature of the air. Take a look at the video below to see an animation of the device at work. Dr. Whisson is a fascinating guy; see an online video presentation about the inventor at Max Whisson - Windmills of Your Mind. Learn more at WaterUnlimited the Max Water website. Thanks to Shane for getting me back on this story.